We all know that digging can be a back breaking chore. Constant bending to pick up soil and turn it gives you backache. This ingenious tool (popular in the 1970s and now back in production!) has been specially designed to reduce back strain and effort with the bonus of digging at up to twice the speed of a conventional spade. All you have to do is take a spit, pull back on the comfy handles and a large spring at the base of the shaft acts to throw the soil forward and turn it over. It features a carbon steel blade which holds a lovely sharp edge, galvanised fixings and ‘comfy grip’ PVC handles. Overall length approximately 120cm (47"), fully extended 128cm (50"). 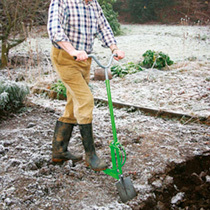 Let the spade do the work - no more bending! Secure the blade to the bottom of the shaft; the bolt for this is already loosely inserted. Remove the bolt and pass it in order through: flat washer, blade, main flat spring, footplate, spring washer and then secure with the nut. Use the 17mm spanner and allen key provided to securely tighten the bolt. Slide the handle into the shaft. As a guide, when standing on level ground your forearms should be parallel with the ground, but you will find the most comfortable height for yourself with use and practice. Using the spanner provided, tighten the clamp. TIP: Start with the handle at the lowest height and reset when you are familiar with using the spade. Before digging, depress the two arms of the small coil spring to clip under the large bow spring, from the outside. After digging release the arms of the coil spring to prevent spring fatigue. SAFETY: Beware the spring does not snap back and cut your finger. If you’re uncertain then depress the spring with a piece of wood or pull back with a loop of string.